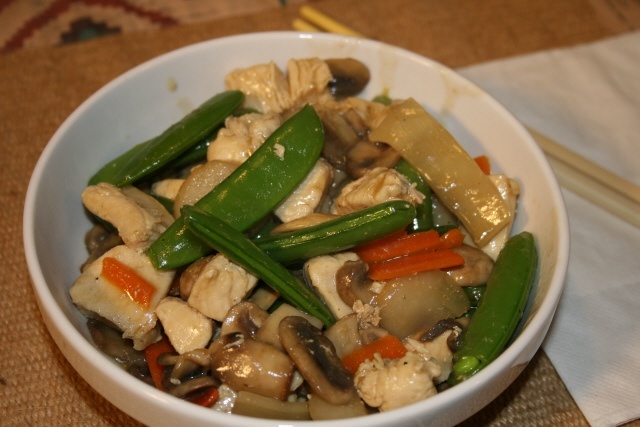 Moo Goo Gai Pan is a stir-fry dish of chicken and mushrooms and some other vegetables depending on the paticular recipe. My particular favorites are pea pods, water chestnuts and thin carrot slices. This dish is sometimes served with a thicker brown sauce but I prefer the lighter chicken broth sauce presented here. If you like chicken and mushrooms, there are pleanty of both here. Mix marinade ingredients together and set aside. Cut chicken into thin strips or bite-sized pieces, depending on personal preference. Combine marinade and chicken pieces and mix well. Cover with plastic wrap and allow to marinate in the refrigerator for at least 20 minutes. Peel and cut carrot lengthwise to make a large flat surface. Use a peeler to make thin carrot strips. Rinse maushrrom under cool running water. Trim stem end. Use knife or use egg slicer to cut mushrooms into thin slices. Rinse packing juice from water chestnuts and drain. Cut into thin round slices. If using bamboo shoots, drain packing juice and rinse . Mix saue ingredients and stir to make a slurry. Set aside. Heat wok or frying pan. Add 2 tablespoons of oil. Stir fry chicken until cooked through. Remove from pan and set aside. Add additional tablespoon of oil to wok or frying pan. Add carrot slices and mushroom slices and stir-fry for about 3 minutes or until mushrooms are almost cooked through. Add snow peas, water chestnuts, and bamboo shoots. Stir-fry until pea pods are tender, about 2 minutes. Return cooked chicken to pan and stri-fry until heated through. Push chicken mixture up on the sides of the wok. Stir sauce ingredients and pour into the center of the wok. Cook and stir the sauce mixture until thickened. When the sauce has thickened, stir the chicken mixture and sauce together.